Since 2005, when the highly-pathogenic avian influenza virus H5N1 started spreading across the globe, researchers have been faced with the question how the virus can spread across entire continents so quickly: does the virus travel through trade with poultry and products, or does it hitch-hike with migratory birds? Jonas Waldenström, professor in Disease Ecology, and Mariëlle van Toor, postdoctoral fellow in Ecology at Linnaeus University, have now been granted SEK 3.5 million by the Swedish Research Council for the project "Avian influenza in Bangladesh: the role of wild waterfowl in disease transmission." In collaboration with researchers in Bangladesh, they will gather and analyse large quantities of data on how the transmission of viruses takes place. They will capture wild dabbling ducks and equip them with small GPS/GSM transmitters that record location and other sensory information with high accuracy. The GPS transmitter is charged with the help of solar cells and data is transmitted via the mobile phone network so that the ducks always can be monitored by the research team. This will allow the researchers to study the birds' movements day and night in close to real-time. 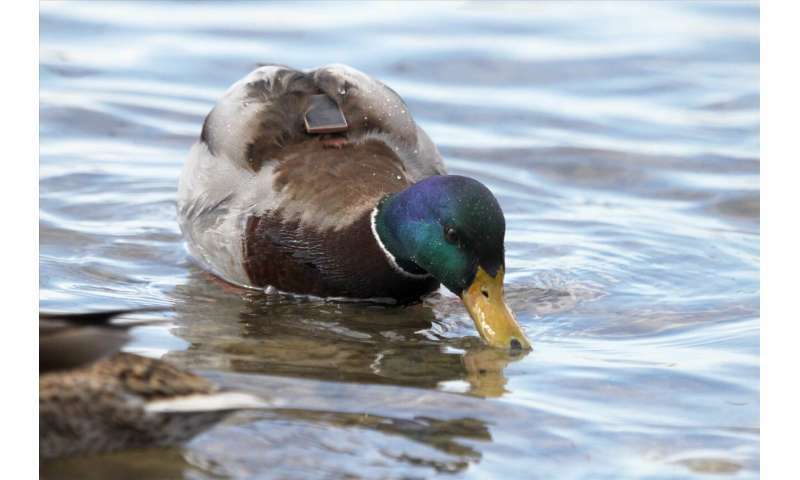 The ducks are fitted with a small GPS transmitter, designed as a backpack with a strap over the chest. The large amount of information from the ducks provides a detailed picture of the ducks' lives on the wintering grounds in Bangladesh and on their migration to their breeding grounds somewhere in the Russian taiga or tundra. The researchers are interested in finding out which migratory routes the ducks use, how fast they fly, during what hours of the day they migrate, and where they stop along the way. Together with detailed information about poultry production in Bangladesh, these data can be used to create movement models which can then be linked to epidemiological data to predict risk areas for disease transmission. "The very latest technology within telemetry has provided us with new tools that make it possible to link together epidemiology and bird migration ecology. It is incredibly fascinating to be able to sit at your computer in Sweden and watch the movements of a duck in Bangladesh. Data from many ducks gives us the opportunity to study how highly-pathogenic avian influenza viruses spread in different parts of the world," explains Jonas Waldenström. "We have two questions we want to answer with this project. How does the transmission between domestic and wild birds takes place, and does this transmission contribute to the risk of the disease becoming endemic? And, can long-distance migratory ducks introduce new strains of viruses into Bangladesh. The project is linked to a larger project in which we work with the same technology in South Korea and Europe. One aim for the larger project is to understand how bird migration can spread viruses across the entire Eurasian continent," says Mariëlle van Toor.